The world of the smallest is a fascinating world, invisible to the human eye but extremely important for life on earth. The soil beneath our feet consists, among other things, of pores filled with air and water. In this aquatic environment there are different biotopes that are closely related to micro life in lakes and rivers. We come across two groups that exert the greatest influence on the processes in the soil. This is the world of nematodes and protozoa. Protozoans are single-cell micro-organisms that feed on bacteria. Nematodes are found in almost every soil. They find their way through the soil, sometimes they swim in water-filled pores (just like their cousins in aquatic environments), but more often they push their way through very fine, partly air-filled, openings. Most nematodes feed on fungi, bacteria and algae or hunt other soil residents. 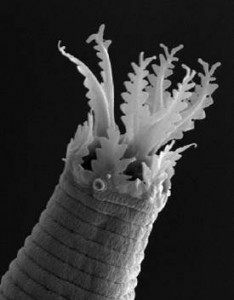 10 to 20% of the nematodes feed on living plant material. All of this micro life affects each other. For example, grazing nematodes have a significant effect on the growth and activities of fungal and bacterial populations. It is therefore of great importance to strive for diversity in the different types of nematodes in order to provide the necessary balance. How is food for soil life provided? It is a matter of eating and being eaten, and what is thereby excreted serves as food for the next group. For example, bacterial cells contain nitrogen. These bacteria serve as food for bacteria-eating nematodes. However, the bacterium contains more nitrogen than the nematodes needs. The nematodes excrete excess nitrogen which is available directly for the plant. The activity of this type of nematodes can account for 30-40% of the nitrogen that can be absorbed by the plant. This clearly shows the importance of stimulating balanced nematode populations. WHAT HAPPENS TO THE GOOD NEMATODES? Results of a trial conducted by test facility Delphy (Netherlands): the effect of Nemater on Pratylenchus and “friendly” nematodes.